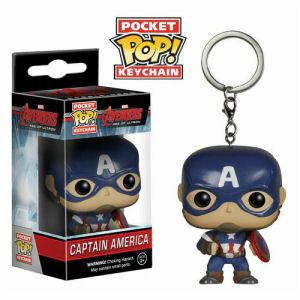 We have Just Sold out of Avengers Age of Ultron Captain America Pocket Pop! Vinyl Figure Key Chain. Not to Worry! Fill in the Notify me When Available and you will be the first in line for our restock of Avengers Age of Ultron Captain America Pocket Pop! Vinyl Figure Key Chain !! From the The Avengers 2 Age of Ultron Pop! Vinyl collection by Funko. Avengers Age of Ultron Captain America Pocket Pop! Vinyl Figure Key Chain. This Pocket Pop! Vinyl Figure Key Chain stands approximately 1.5 inches tall and comes with an attached key ring. Funko Avengers Pop! Vinyl shipping from Canada. No Surprise Border fees or Customs!